New EPA regulations have changed the emissions standards for coal fired power plants operating in the United States forcing them to reduce their Sulfur dioxide (SO2), Sulfur trioxide (SO3), Mono-nitrogen oxides (NOx) and Mercury levels. The four ways power generation facilities can meet these new EPA guidelines include: Retirement/closing the power plant, Power conversion to a cleaner energy source such as natural gas, adding a scrubbing systems to the current power generation facility or by retrofitting current plants with Dry Sorbent Injection (DSI) systems. DSI is the process of adding an alkaline material, typically either Trona or Sodium Bicarbonate (SBC) to the flue gas stream to react with the acids and capture harmful toxins before they escape up the stack and into the environment. Plants employing DSI systems have the raw material off-loaded into storage silos then utilize pneumatic conveying systems to transport materials to in-line milling stations, where the material is milled and then injected into the flue gas stream at different prime injection points. There are many benefits of choosing DSI to meet EPA compliance for both municipal and industrial boilers. DSI is often chosen because it is the most cost-effective way to mitigate these toxins. It requires significantly lower capitol to retrofit current power plants and is simple to install and operate. In addition, DSI systems require relatively little lead time for implementation compared to other options. DSI systems, although very effective, do have some hurdles. SBC is often the preferred injection material because of its price point, availability, and capabilities. When SBC is delivered to the power generation facility the particle size is too big for effective mitigation. The SBC must first be milled to much finer micron size in order to be dispensed into the flue gas stream at the prime injection point. In addition, SBC has a caking quality when the temperature of the material rises above 140°F or varies greatly during the process of grinding. Any caking of the material with cause it to coat the inside of the equipment resulting in an inoperable system and downtime at power generation facility. This facility downtime can result in losses in the millions of dollars per day. Prater Industries’ Air Classifying Mill (CLM) is capable of grinding Sodium Bicarbonate to very fine micron size (D90 of 10 microns). The three stage material processing of the CLM ensures a tight particle distribution. The initial grinding state is similar to what is accomplished with the M Series Fine Grinding Mills. However, a secondary inlet provides additional air for the second stage internal air classifier wheel. This additional air adds an element of cooling to the material being processed. The cooling feature is especially important in processing Sodium Bicarbonate to maintain an acceptable temperature range to prevent caking of material and coating of the mill and pneumatic conveying system. Oversized particles that are larger than desired are recirculated by the classifier and are then directed to a secondary grinding chamber. The recirculated material is ground again and redirected to the classifier, allowing only properly sized product to exit the mill to be injected into the flue gas. At Prater Industries, results come first. Our products work to serve your dry processing, powder and bulk solids applications. 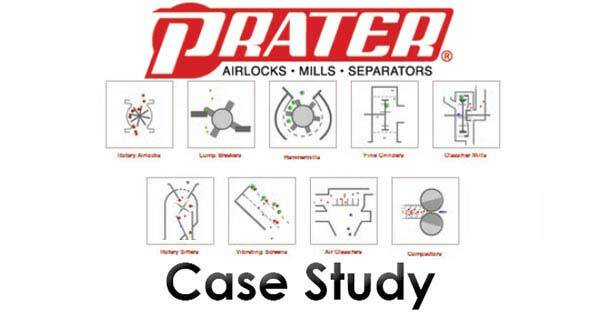 With Prater’s extensive line of equipment and systems, you will obtain the best possible results of your process time after time. Each of our high-quality products are developed to serve each industry differently, in order to provide the desired outcome of each processing application. At Prater Industries, results come first. Prater has been providing reliable particle management solutions since 1925.The company specializes in an extensive line of equipment and engineered systems including rotary airlocks, fine grinders, classifier mills, lump breakers, hammermills, screeners/separators, and compactors.